It’s been ages since I’ve written about cinema here, which is not at all to say that I’ve been neglectful when it comes to actually partaking of the medium. Last year, I unexpectedly fell head over heels for the sharp, juicy Notes on a Scandal, in which Judi Dench sets herself well apart from the tiresome Ladies in Lavender clique (though her earlier collaborations with Derek Jarman may also have hinted at a more artistic strain in the Dame, and her collaboration with Stephen Frears and Bob Hoskins, Mrs. Henderson Presents, was sorely misrepresented by its marketing and much, much better than they made it look). But, as I’ve been taking advantage of some downtime between summer and autumn quarters to take some chances on some cinematic unknown quantities (a description that would also include the fabulous Notes, the director of which last helmed the okay but rather tepid Stage Beauty), I thought I’d put down some scattered thoughts on a few little glimmers of movie bliss that I’ve happened across in the recent past. 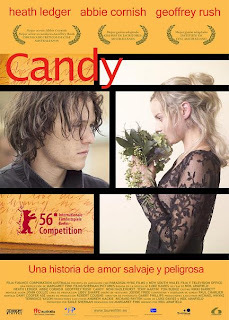 A minor but true cinematic pleasure: The Australian film Candy, with Heath Ledger and Abbie Cornish as a heroin-addicted couple, in love and doomed (bien sûr!). Even despite the enticing presence of the very talented Ledger, doesn’t it still sound like something you’ve seen a dozen times already and have grown tired of (that is, if you were ever affected by in the first place)? It is far from a perfect film; the first half-hour to forty-five minutes indulges in some fairly typical editing and soundtrack moves that are all too predictable for this type of film. However, the film quiets down after that, and it seems to finally find a reasonably engaging shape by conforming to some of the real-seeming, grey-area contours of such a relationship amid such a lifestyle. Ledger and Cornish are wonderful, and even though you wish the film didn’t have that bothersomely frivolous first third, it does build to an authentically moving finish. Definitely worth a rental. I’ve always been fonder of the forbidden-lovers-on-the-run genre of cinematic romanticization than of the heroin-love variety of the same. (I’d re-watch Tom Tykwer's wonderful Heaven a dozen times before revisiting Jesus’ Son, for example, though I didn’t dislike the latter.) David Jacobson’s film Down in the Valley certainly has some of these qualities, though it gets more complicated as it goes along (let’s just say that by the end, the viewer has gone beyond taking sides between the lovers and the parent/establishment figure standing in the way of their love). The film stars Edward Norton and Evan Rachel Wood as, respectively, a down-and-out drifter, a gas station attendant whose aw-shucks cowboy persona, endearing and believable as it is at first, begins to come into question; and the teenaged girl, going through the usual troubles at home (compounded by the harried, overprotective oversight of her single father, a cop), who falls madly in love with the attendant/cowboy. The other star of this film is the threadbare San Fernando Valley, a picturesquely rundown, lower-middle-class patch of which is here given the same kind of treatment by Jacobson and cinematographer Enrique Chediak that David Gordon Green and Tim Orr (George Washington) have given to their Southeastern-rural locales. Its aesthetic properties elevate the whole to a visually resonant, quasi-mythological plane. And if the film’s most noticeable drawback is the occasional over-obviousness of the fact that a very significant part of the myth they’re working with is Taxi Driver, then the astute awareness of and skepticism toward self-mythologizing that it shares with Scorsese’s film comes close enough to making up for it. Norton’s character is ultimately tragic—and Wood’s ultimately a heroine—because of one’s ability to mistrust full immersion in myth, and the other’s seemingly inevitable succumbing to it. To say too much more would be to give away the film’s many surprises. Suffice it to say that hypocrisy and self-righteousness can exist in the most subtle, buried, and disguised forms in the world Marsh gives us, and much of this movie’s pleasure derives from the tone of inevitability given to the dire consequences it attributes to those transgressions, and from its positing of the past’s inescapability, which is one of the surest signs that, megachurches and SUVs or no, The King stakes out middle American suburbia as prime noir territory. This autumn looks to be fantastic on the cultural front—so many things to look forward to! 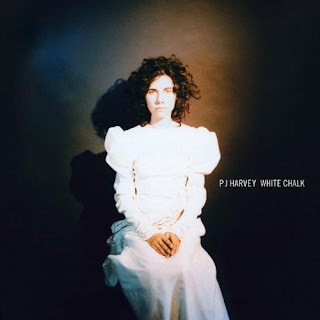 PJ Harvey’s new album, White Chalk, is released in late September. My ultimate conclusion about her last album, the DIY project Uh Huh Her, was that it had its moments but was on the whole uneven; however, Harvey has a commitment to not repeating herself that deserves respect regardless of any missteps. The first single from the new record, “When Under Ether,” has some of the trappings of a piano ballad, but its subdued quality only adds to its creepy atmosphere; it seems to be sung from the POV of a woman anesthetized on an operating table, but it’s less a lament than a sweet hymn to such a condition. I wasn’t sure what to make of it at first—regardless of one’s opinion, however, I think anyone would agree that it’s a most adventurous choice for a single—but it has grown on me. It’s affecting at the very least, and it continues to feed into my hopes for the album. On the film front, there are new ones from both Andersons (Paul Thomas and Wes), Noah Baumbach, Todd Haynes, and Michael Haneke’s very surprising remake of his 1997 Austrian film, Funny Games, along with a new one from Ang Lee, Lust, Caution, that gives off a drool-worthy vibe on the basis of the visuals alone. The 1997 Funny Games is a masterful film that demonstrates Haneke’s sublime prowess...and it’s also a film I’m still not sure I ever want to see again (though I will be forced to see the remake, as it has Haneke’s stamp of approval and will star the eminent Naomi Watts, whose decision to lend her star power to such a risky and challenging project is to be lauded and supported). The film’s plot is standard thriller stuff: A couple of murderous young psychos take a nice bourgeois family hostage at their summer vacation home, and the desperate vacationers attempt futilely to escape. But Haneke's approach to the material makes you feel your complicity as a viewer every step of the way. There’s scarcely a minute in the film where you’re not forced to ask yourself, “Don’t I actually want to see the dreadful things, the acts of senseless cruelty and violence, that this film is threatening to inflict on these characters?” There’s a memorable moment when one of the villains, stalking a potential victim, turns to the camera and winks at us. It’s like a horrific, indicting rendition of that famous moment at the end of Breathless where Jean Seberg breaks the fourth wall, but whereas the effect of Godard’s pointing up the artificiality of any notions of cinematic “realism” makes the game seem charming, fun, and flippant, Haneke uses his breach of the fourth wall to say something much more ambivalent about the “funny games” that he evidently believes all culture participates in (the feeling is definitely not “funny ha-ha,” much more “funny bizarre”). Whether that intent, with its implicit harsh criticism, is valid or not is a matter of opinion. But it’s difficult to argue that Haneke is capable of attaining it to great effect. It will be incredibly interesting to see if he’s able to pull off the same feat in an English-language, made-in-America remake. I tend to adore the films of Todd Haynes—his masterpiece, Safe (1995), is one of the best films ever made—but even so, I was a bit taken aback when I first heard about his plans for a “Bob Dylan biopic.” I must confess that I’m a much bigger fan of Haynes than of Dylan, whom I’ve found intermittently interesting, but whose status as a towering legend I find somewhat puzzling (I almost invariably enjoy other artist’s interpretation of his songs, like PJ Harvey’s fantastic “Highway ’61 Revisited,” more than his own). If a film dealing in and with pop-music iconography is creative impulse, it would seem that Haynes’s recurring themes (identity, sexuality, culture/society) were better served by his 1998 glitter-rock piece, Velvet Goldmine. 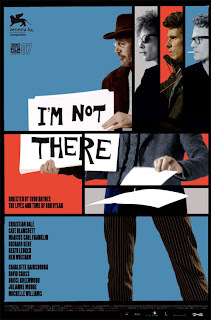 However, the little glimpses available so far of I’m Not There make it look very appealing, and very Haynesian (to my relief). Different aspects of Dylan’s life and work will be embodied by six different actors: Christian Bale, Cate Blanchett, Marcus Carl Franklin, Richard Gere, Heath Ledger, and Ben Whishaw. This is a very intriguing proposition. The idea that anyone is just one person is absurd; even the most average person, living a life of quiet desperation, is a different person at work than he or she is at home. With that idea in mind, one could even wonder if six is even enough for someone who has made himself over with apparent purposefulness as many times as Dylan. I’ll be there the minute this film opens to try to figure it out. During Christmas vacation, 2006, right after Criterion’s indispensable box set of Eric Rohmer’s Six Contes Moraux was released, I watched all six in fairly rapid succession, which was one of the most intense cinematic treats I’ve ever allowed myself (I had only seen Claire’s Knee and Love in the Afternoon prior, but those are films I’d gladly watch and re-watch again). 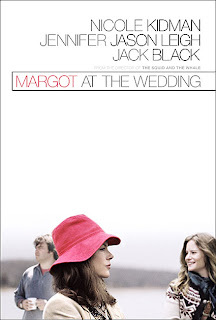 Rohmer’s films tend to have titles like Pauline at the Beach, My Night at Maud’s, etc., so I think that with that knowledge and the clever little half-mocking nouvelle vague references in Baumbach’s wonderful last film, The Squid and the Whale, we can at the very least infer that the title of his upcoming Margot at the Wedding is meant to signify the “Rohmeresque.” It stars Nicole Kidman (for whom I hope this plum role will be a return to Birth/Dogville form) and the underused Jennifer Jason Leigh (who also happens to be Baumbach’s wife). The wild card is Jack Black, whose “charisma” usually wears off for me after about two minutes. Will the film elevate him, or will he drag the film down? I’m keeping my fingers crossed. Last summer, as part of a project for an American History class I was taking, I read Upton Sinclair’s novel Oil!, from 1927. It’s a very effective and humane bit of socialist propaganda (a description that I in no way mean to be pejorative). Paul Thomas Anderson’s new film, There Will Be Blood, is an “adaptation” of that novel, but everything I hear points to it using Sinclair strictly as a jumping-off point. That’s fine with me: no film can be “true to the book,” and all those people who complain when a film doesn’t adhere to every detail of a novel don’t seem to understand the very different properties of the two media. Do they really want to sit through a film that has a 15-hour running time so it can dramatize every last sentence of the novel? (I’d be willing to bet even Erich von Stroheim’s Greed, his much-mourned, rarely-seen, lost film of Frank Norris’s novel McTeague, doesn’t actually contain everything in the book.) So it’s a curiosity-piquing project for the always intriguing and entertaining, sometimes phenomenal (I’m one of those who adore Magnolia) Anderson. How “period piece” will it be? How political? (Perhaps some hints can be gleaned here.) 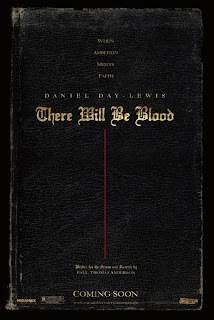 It stars Daniel Day-Lewis and Paul Dano, so one ostensible certainty is some must-see work on the acting front.